I’ve tried a Handbrake U-Turn while traveling forwards, but never backwards. My father and I have suffered a great number of setbacks to our relationship. I moved across the country a couple of years back, and even before then we weren’t on speaking terms. This distancing was quite a shift from the way it had been for as long as I can remember, and the process was difficult for all the reasons that one would expect, but I don’t regret it, because stepping out from under his shadow has proved to be one of the best decisions of my adult life. It is a very real possibility that I may never speak to my father again while wrapped in this mortal coil. Still, there are some happy times in our history that I hold on to, in spite of any darkness that may have preceded or followed them. I may not wish to see or speak to him in the present, but I cannot and will not discount the positive moments of the past. Enter James Garner as Jim Rockford. Watching The Rockford Files with Dad on Friday nights was a highpoint of my childhood. I was a bullied and emotionally broken kid by the time I saw my first episode, and television provided a much-needed temporary respite from the nasty villains that lurked in the shadowy halls of the local elementary school. With the ringing of Jim Rockford’s rotary phone at the opening of each episode, I became a wisecracking private investigator with an underdog complex that would rather see justice served than collect a payment for services rendered. I could take a punch and come back swinging and I always won the day, even if the winning sometimes took a week or two. I almost always got the girl, or at least a hint at getting the girl, but life with a girl would become too complicated for a free-spirited guy like me, and so I felt destined to wander alone, while enjoying the occasional moment with the softer company (nudge, nudge, wink, wink) but staying clear of the trappings that accompanied commitment. After each episode, I would fall asleep hoping for vision-dreams of my future life in a trailer near the beach, flirting with beautiful women, arguing without anger against my father’s suggestion that I find a safer, more reliable source of income, and driving a sweet set of wheels capable of pulling a Handbrake U-turn while speeding in reverse (a maneuver performed by James Garner on the show that quickly became known as the “J-Turn”). In truth, I’m not even sure how many episodes I watched with my dad; it might have only been a single season. Something tells me it was far more than that, but if my memory mis-serves me, what does it matter now? The shape and feel of those moments are soft and free of sharp edges, and although I can’t picture anything more than scenes of Jim Rockford driving his copper-mist colored Firebird, punching bad guys, or talking to beautiful women, I know that Dad was there beside me for it all. 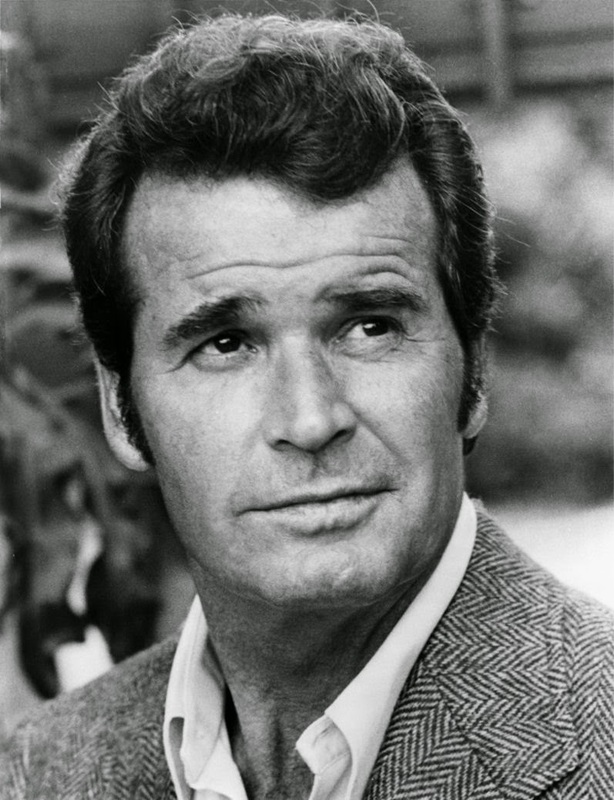 James Garner died this past Sunday, and when my wife texted me a link which conveyed the news, I was sitting alone in the foyer of our church building (yes, I was skipping Sunday School). I stood and left the building as a flood of memories filled my headspace. I stood in the shade of a tree and found myself holding back tears over someone that was in all corners of reality a stranger to me. I pulled up Youtube on my phone, searched for The Rockford Files, and found a video accompanied by an extended version of the theme song, complete with some excellent guitar solos. And what a theme song! I have it on my iPod, and sometimes I play it while driving a little too fast, with thoughts of chasing (or is it evading?) the bad guys running through my head at high speed. Maybe someday I will throw the car into reverse, slam the gas pedal to the floor, and then pull up on the handbrake as I spin the wheel for a J-Turn. But life is too good right now to risk the J-Turn, so for now I’ll just watch Jim do it as I stream all six seasons on Netflix.